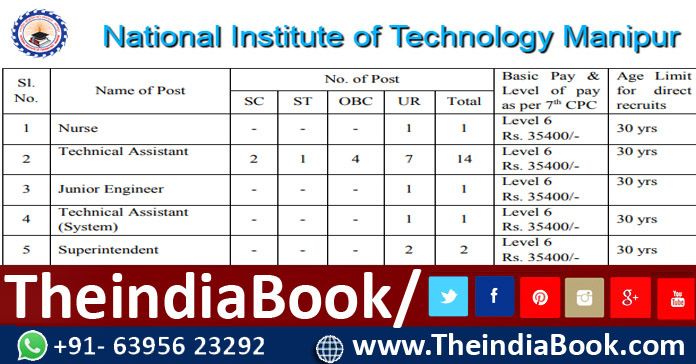 NIT MANIPUR RECRUITMENT INFORMATION : National Institute of Technology (NIT), Manipur has opened the notification For Nurse, Technical Asst, Jr Engineer, Superintendent, Accountant, Jr Asst, Technician/ Laboratory Asst/ Lab Work Asst, Attendant/ Multitasking Staff vacancies. Those Candidates who are interested in this Vacancies Posts , Kindly Check their Eligibility, Exam Date, Syllabus, Question Paper please read details & completed all eligibility criteria can read the Official Notification below..
Pay matrix as per 7th CPC. General Central Service, Group ‘B’ Gazetted, Non Ministerial.